Take part in a great opportunity for future and current educators to learn how to integrate environmental education into the classrooms. For this year’s 2nd annual education conference the theme has been developed around Outdoor Education and working Beyond the Classroom walls. This year’s event will cover 2 days in the early fall to give a whole new experience for educators. 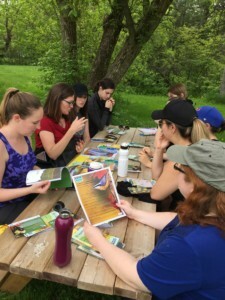 Highlights include using nearby nature as an outdoor classroom, forest walk, tree identification and care, camp fire activities, a presentation from the company DreamRider, and more. On the second day of the conference there will be an opportunity to be included in planting trees on the grounds of Maison Tucker House. Options for carpooling, childcare, and accommodations are available if interest is indicated on the registration form. Please register no later than September 14th to reserve your spot. If you would like to receive updates on the conference please use our google form to indicate your interest. For information on the conference in September email thseventhgen@gmail.com. We would like to thank the Ottawa Community Foundation for providing funding to run this conference.